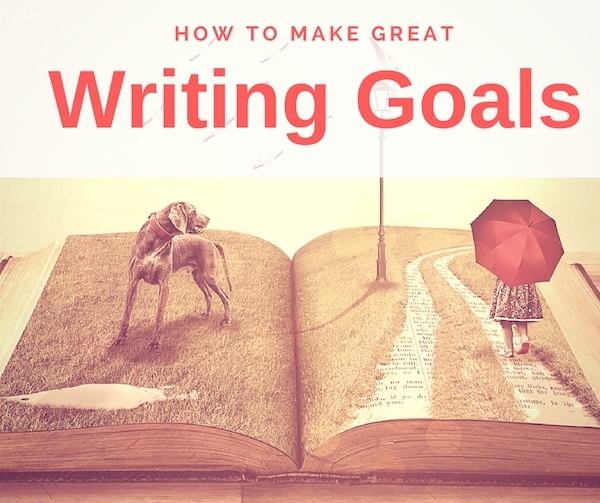 Have you made your writing goals yet? Writing goals are one of those things most writers either shy away from or slouch into. But it doesn’t have to be that way. Let’s look at 3 typical writing goals, and I’ll show you why they’re bad goals and how you can improve them. First of all, let me say that all of these are good things to aim for. But if you write your goals this way, you’re destined to fail. Let’s take the first one: Write a book. How about you try something more manageable? Something you can do on a daily basis? That way you will have a success every single day, and a series of successes will build into success for the year. Those are small goals you can accomplish (or fail at) multiple times. Each time, you have the chance to start over and either succeed or fail again. And if you do any of those goals consistently over a year, you will end up finishing your book within a calendar year. And small, daily goals won’t leave you feeling like you’re wrestling Andre the Giant. Let’s look at the second goal: Get published. Maybe you have some short stories you want to publish, or a children’s book, or a novel. Whatever it is, this goal doesn’t work because it’s an outcome that doesn’t rely on you. In other words, you could do everything humanly possible to get published, and if the gatekeepers say “no,” then you’ve failed on your goal (but through no fault of your own!). Don’t make goals that require other people to do things. Make goals that only require your own participation. So how can we rewrite this goal? You see how all of those are actionable steps that depend on you? Now you’re not waiting around hoping someone else fulfills your goal for you. At the end of the year, you will either know that you have tried as hard as you could to get published, or you have failed because of something you failed to do. Let’s look at the last goal: Read X amount of books. Now, this isn’t a terrible goal. In fact, in some ways it’s a good goal because it’s measurable. At the end of the year, you will either have read that many books or not. And nothing is more essential for the growth of a writer than reading books. Are you reading the right books? Are you reading the books that will help your writing the most? Are you reading great examples of what you’re trying to write, and are you reading great teachers of writing? Are you reading in the most profitable way? Do a thorough self-evaluation of your reading based on these questions, and max out your reading potential. Since reading is the fuel for writers, you should pay close attention to what grade of fuel you’re putting into the engine. If you keep on reading in a narrow niche, you might be putting yourself in a corner. Read diversely. Read international books. Read poetry and business and self-help and short stories and parenting and creative nonfiction and novels. Read classic books and books of the present year. Read books by men, women, and authors of various ages. If you do a rundown of the books you read last year, I bet you might be surprised at how narrowly you read. In this new year, make a concrete plan to expand that. How would we rewrite this goal? To set aside a sacred time each day devoted solely to reading, say from 9:00 to 10:00 at night, or as soon as you wake up in the morning. Don’t set yourself up for failure this calendar year by writing your goals in the wrong way. Hope that was helpful! Happy New Year, and good luck with writing this year!